By Rick Manning — Astonishingly, the unemployment rate dropped again in April even though there are 169,000 fewer Americans employed than in March. Equally incredibly, in spite of there being more than 8 million more people in the working age population, 319,000 fewer Americans have jobs today than when Obama took office. To make matters worse, 522,000 Americans dropped out of the labor force entirely in the month of April. It is the labor participation drop-out rate, which allows the Administration to claim that the unemployment rate dropped in April to 8.1 percent. With more than 5.1 million Americans having dropped out of the nation’s labor force since Obama became president, and the government does not count them as unemployed. If these labor force drop outs were counted in the ranks of the unemployed, the real unemployment rate would be 11.1 percent, instead of the claimed 8.1 percent — a full 3 percent higher rate. Here is how four key indicators of America’s real employment situation look over the course of the Obama Administration. All data is from the federal Bureau of Labor Statistics, which is overseen by the U.S. Labor Department. 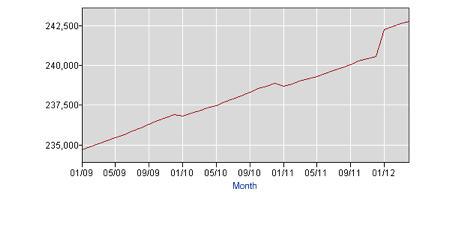 Every month, the civilian, non-institutionalized population steadily rises. This is the population which is eligible to be in the workforce. Most economists believe that the economy needs to create at least 150,000 jobs a month just to keep the unemployment rate steady. In April, the civilian non-institutionalized population rose by 180,000 to 242,784,000 people. With a population of 313 million total, there are about 61 million Americans who are not counted in this number due to age, military service or incarceration. Since Obama became president, the civilian non-institutionalized population has risen by 8,045,000 people. 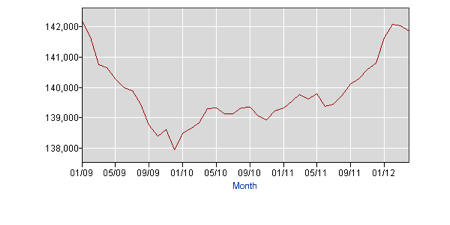 The Labor Participation Rate measures what percentage of the non-institutionalized civilian population is participating in the workforce either through having a job or looking for one. Fewer Americans participating in the workforce means a greater burden on those that do. The rate in April, 2012 dropped from 63.8 percent to 63.6 percent. If the Labor Participation Rate had remained steady throughout Obama’s term, the current unemployment rate would be 11.1 percent. 169,000 fewer Americans were employed in April than in March. Since Obama took office, there are 319,000 fewer Americans employed, in spite of the eligible workforce population growing by 8.045 million people. The total number of Americans who are employed in April 2012 was 141,865,000. This is the civilian non-institutionalized population that is not in the labor force. The numbers shown in the chart are in thousands, meaning the number of workforce eligible people not in the labor force in April is 88,419,000 people. This is compared to the 80,502,000 who weren’t in the workforce when Obama became president. Stunningly, the increase in the number of people who are not participating in the labor force is almost equal to the total increase in the overall civilian non-institutionalized population since Obama took office. This means out of the entire potential labor force growth over the past three and a quarter years, the labor force itself has only grown by slightly more than 130,000 people. There are other very important statistics like the number of unemployed, which shows more than 12.5 million people who want a job and can’t find one. The personal and economic devastation for each of the 27.5 million people who are either unemployed or underemployed is impossible to overstate. To put this into perspective, the number of unemployed and underemployed in America under Obama is just slightly smaller than the total combined populations of the states of New York and New Jersey. The number of drop outs during the Obama Administration is the equivalent of the entire population of Colorado. That is the total population of three major states unemployed, underemployed or dropped out of the economy entirely. Is there any question why our nation’s economy is floundering? What we can learn from April’s unemployment report? The continuing decline of the labor participation rate threatens to have devastating consequences to our overall economy. Currently less than half of America is in the civilian labor force, and only 45 percent of the population actually has a job. This is before the baby boomer generation hits retirement age in full, and signals that workers/taxpayers are in danger of becoming a permanent minority in our nation. Ultimately, when Americans are out of work, and out of the workforce, our nation suffers. Our national revenues don’t grow, while our costs of government explode. Our national sense of purpose gets lost, as people lose their own sense of purpose. Our national will gets weakened, as our people lose their determination to build a better life for their families without being dependent upon the government. The April unemployment report shows an American workforce which is reaching the tipping point where those who work are rapidly in danger of being viewed by those who don’t as little more than ignorant marks who should be fleeced to benefit those who depend upon the government. In a mere three and a half years, America’s economy has been pushed toward an abyss of dependency. A dependency that strips away our people’s basic freedom and independence as the majority becomes more and more indebted to unaffordable government programs that paid for by the remaining workforce. When you look beyond the 8.1 percent unemployment rate, you cannot help but hear the warning sirens for our nation’s future. *Note: All data is from the Bureau of Labor Statistics Employment Situation report. Rick Manning is the Communications Director of Americans for Limited Government and the former Public Affairs Chief of Staff at the U.S. Department of Labor.